In general, beaded bracelets that are not stitched (or woven together using a needle and thread), are typically made by a bead stringing technique. Making bead stringing bracelets is a relatively simple and fun process of stringing beads onto a bead stringing material and choosing the appropriate bracelet finishing technique. Just as there's an abundance of types of beads you can string together to make a strung bracelet, there are a wide variety of bead stringing materials that can be used to create different styles of beaded bracelets. Some of the most common bead stringing materials include, but are not limited to; soft and flexible beading wires (such as SoftFlex and Beadalon), harder wires (such as German jewelry wire and memory wire), clear monofilament (such as Illusion Cord), elastic cords (such as PowerCord or Gossamer Floss), leather cording, hemp, jute, string, satin cord (or rattail), ribbon, yarn, and a wide variety of beading threads (such as FireLine, Nymo and silk). 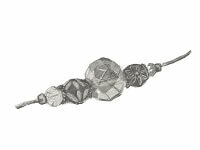 Whether you’re looking for simple beaded bracelet patterns, or you want to make beaded bracelets that incorporate other bead design elements (such as charms, chain or cool focal items), we have a wide variety of stringing bracelet designs for you to choose from - with fun new beading patterns added weekly.